Today, the Cob Gallery in Camden, London, opens with its final solo show of 2017 and first of 2018. Joseph Sweeney’s Loose Change is his second at the gallery. 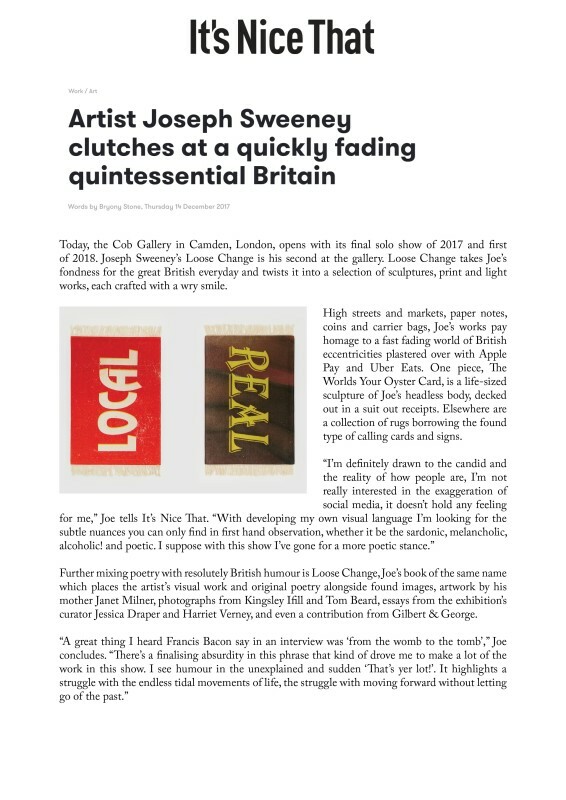 Loose Change takes Joe’s fondness for the great British everyday and twists it into a selection of sculptures, print and light works, each crafted with a wry smile. High streets and markets, paper notes, coins and carrier bags, Joe’s works pay homage to a fast fading world of British eccentricities plastered over with Apple Pay and Uber Eats. One piece, The Worlds Your Oyster Card, is a life-sized sculpture of Joe’s headless body, decked out in a suit out receipts. Elsewhere are a collection of rugs borrowing the found type of calling cards and signs.